After two eventful, tough and inspiring weeks at Fazenda Almada close to Ilheus, Brazil we successfully finished this year’s tree planting and agroforestry project. 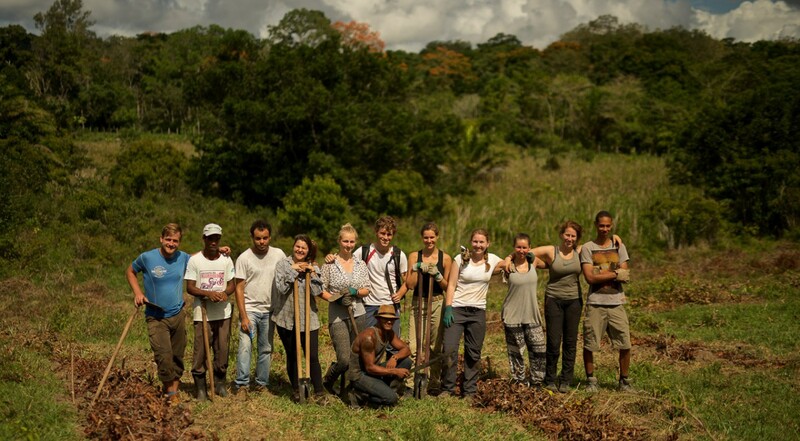 We planted 605 tree seedlings, dozens of pineapple, beans, manioc, and other fast-growing crops in an area of more than 5200 square meters using agroforestry. The reforestation is part of a larger effort to reconnect the dispersed segments of the Mata Atlantica Rainforest. What once used to cover much of Brazil’s coast, is now one of the most endangered ecosystems on the planet. Only 7-9 % of the original Mata Atlantica Rainforest are left. Our project also helped to increase the biodiversity of the area by re-introducing old native plants. We planted 35 different tree species, some of them much endangered and on the IUCN Red List, for instance the Pau Brasil tree. Moreover, the Fazenda Almada is home to another species close to extinction, namely the golden-headed lion tamarin monkey. Our tree planting project helped to increase its natural habitat and establish a corridor to other parts of the forest. The work was tough at times since even winter in Bahia is very warm and humid. Yet, every single Pangaea member had a lot of fun and learnt many valuable lessons for life. We got to know what agroforestry means and how it helps the environment, the people and the economy by growing food in the forest. Moreover, we experienced first-hand some problems of environmental work. Having less cattle is crucial for reviving parts of the forest and turning pasture into new Mata Atlantica area, just the cow herder we spoke to found it very difficult to depart from his bulls for emotional ties. We also met very inspiring people and built new friendships, growing to a very strong group, that laughs and travels together. Together with Juliana Torres from Fazenda Almada and photographer and environmental activist Markus Mauthe we are now planning to build up a volunteer program for following projects. For this, the organization “Almada Mata Atlantica Project” (AMAP) will be founded later this year, where donations and volunteers are welcomed to also learn about the rich environment of Bahia and help to preserve the ecosystem and the golden headed lion tamarin monkeys. This way, our project has not ended, but was the start of a continuous and sustainable work at the Fazenda Almada and the larger region. Thanks for following us on the journey towards a better future! Quando inicara as atividades outra vez? gostaria de me inscrever, ser voluntario.